Launching in North America this weekend, Bloom Baby will be introducing 4 new products to the baby market over the next few months. This week, I will be profiling each piece with a full description. As soon as I saw the first piece I fell in love with the modern design and European look. 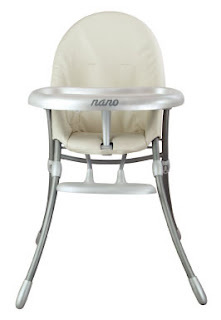 The ‘Nano’ High Chair is Bloom Baby’s entry level highchair. Their philosophy is that you shouldn’t have to sacrifice personal style when you have a baby and it shows by the sleek look of their furniture. I love the sharp stainless steel look of this chair as well as the Micro leather seat. Once you are done with it, the chair folds flat to be put in a closet – out of the way. This makes the Nano perfect for parents who are living a loft or a downtown space where square footage is at a premium. 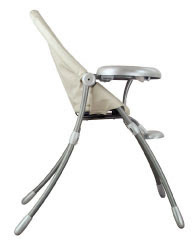 Another great feature is the 2 position adjustable footrest, which will allow the highchair to adapt to your child as they grow. This chair is offered in three colours (blue, pink, and white, shown) and will be available for purchase early summer. $150 U.S.
bloom’s global team integrates the best in aesthetic and functional design from Europe with precision engineering and production; uniquely combining superior style and comfort, innovation and quality. the bloom vision is to enable families to begin parenthood in style with products that enhance lifestyle and sense of contemporary living.